I don’t buy breakfast cereal anymore, much to both my daughters’ chagrin. I had a hard time getting behind the amount of processed sugar each serving of cereal contained. Sending them out the door with all that sugar running through their little bodies made me cringe. 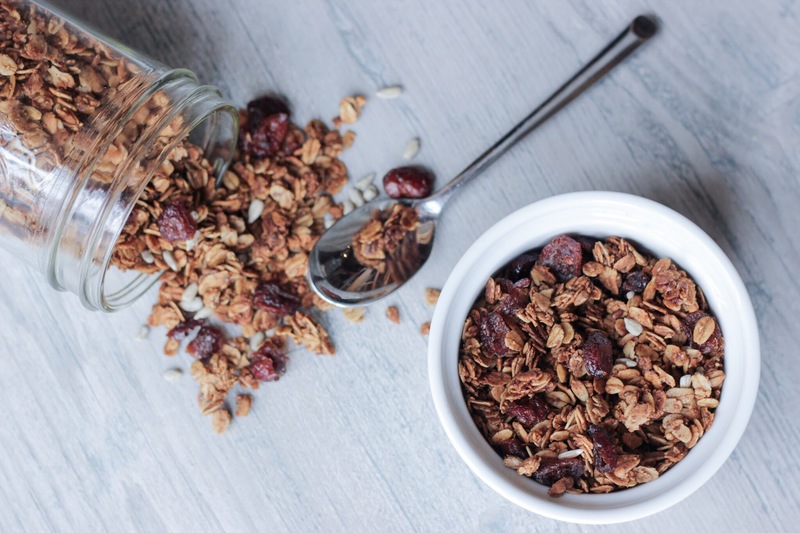 So we’ve experimented with many different breakfast options since we ditched commercial cereals, and this maple vanilla granola is one of the winners! But, isn’t maple syrup sugar? Yes. Maple syrup is sugar. 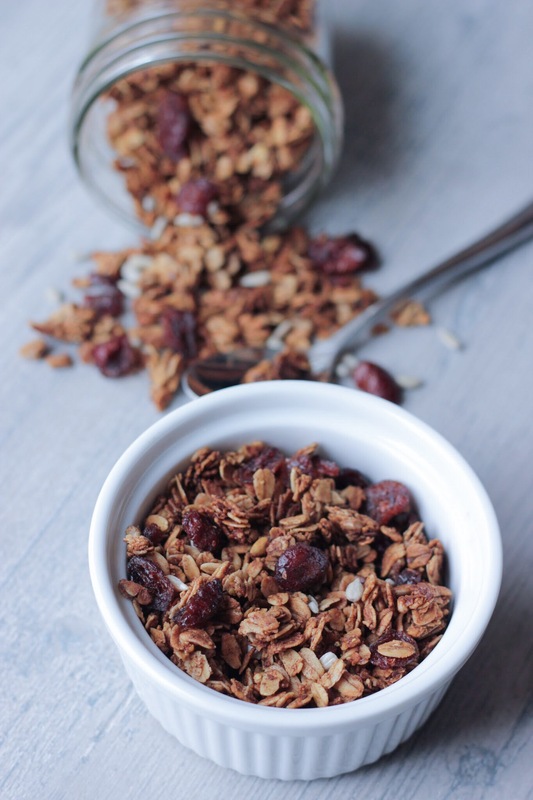 Maple vanilla granola contains sugar from the maple syrup, but is free of refined processed sugars. Processed sugar is an anti-nutrient, which means that it actually works against your body by taking micro-nutrients from it. Maple syrup has been shown to have antioxidant properties and doesn’t work against your body the same way processed sugars do. So, if you’re going to have some sugar, natural sweeteners are the way to go. 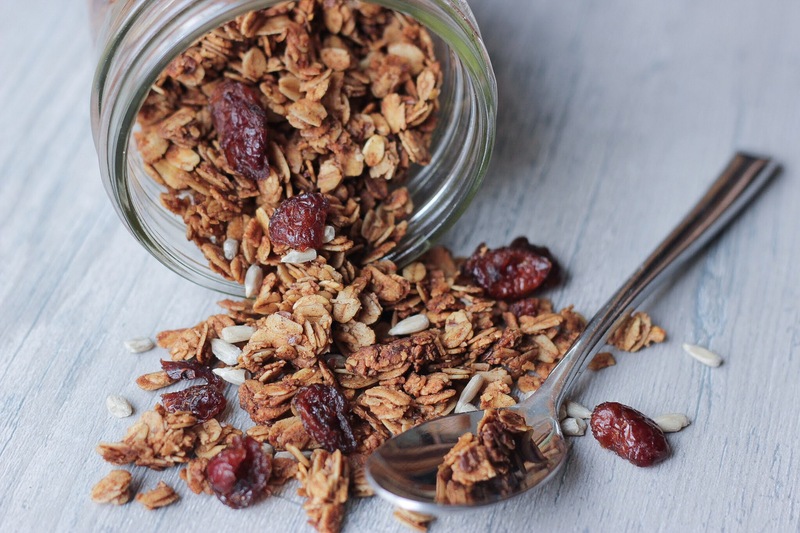 I experimented with a lot of different granola recipes, taking out the refined sugars and replacing them with maple syrup. Finally I came up with this maple vanilla granola recipe that satisfies everyone in our household. This is a very versatile recipe. Sunflower seeds can be exchanged for other seeds or nuts, and the cranberries swapped for other dried fruit. I leave the seeds and dried fruit out until after I bake it so that each person in our family can have their own version of this granola. Mace and I add seeds and dried fruit, but Claire and Anna like to leave the seeds out. Sometimes I’ll throw in pumpkin or chia seeds or some dried apricots. Play around with different flavors and have fun! Dried fruit tends to be high in sugar and should be used somewhat sparingly, as a little goes a long way. I love cranberries, but I’ve tended to stray away from dried cranberries because they typically have a lot of processed sugar added to them. I thought of them as more of a treat than something healthy to eat. Then one day I was browsing the bulk department of our local co-cop and found fruit juice sweetened cranberries! Now that’s something I can get behind. Make sure to read the labels when you’re buying dried fruit to ensure that its unsweetened or sweetened with juice. Many dried fruits, such as mango and apricot, aren’t sweetened at all and are good choices to add to this maple vanilla granola. Of course, fresh fruit is delicious on top too! Oats are naturally gluten-free, but are often harvested using the same equipment as wheat and are contaminated during processing. If you have celiac disease or are especially sensitive to gluten you should buy certified gluten-free oats. How should I eat this Maple Vanilla Granola? We love to eat this as a cereal with non-dairy milk or on top of plain non-dairy yogurt. Granola is delicious on a spring green salad with apples and drizzled with maple-balsamic vinaigrette. I have also sprinkled it on top of maple pecan roasted pears and plant based ice cream for a tasty dessert. There’s never any shame in eating it right out of your hand for a quick snack in the middle of the day either! No matter how you choose to eat this I just know you’re going to love it. Enjoy!! 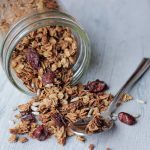 Maple Vanilla Granola is a versatile breakfast option that is refined-sugar free, vegan, gluten-free and delicious! In a large bowl stir together the oats, sea salt, cinnamon and flax seeds. In a small bowl whisk together the melted coconut oil, maple syrup and vanilla. Pour the wet ingredients into the dry ingredients and stir to fully coat the oats. Spread the granola onto the prepared baking sheet in an even layer. Bake for 20-25 minutes, stirring once halfway through, until golden brown and fragrant. Allow to cool on the baking sheet and then add nuts or dried fruit if desired. Store in an airtight container for up to one week. ENJOY!